On October 3-4, food lovers of all skill levels had the opportunity to cook hands-on and up-close with more than 30 of the world’s most renowned chefs at The New York Culinary Experience, the only hands-on event of its kind. Co-hosted with New York magazine, the event took place at The International Culinary Center, home of The French Culinary Institute. 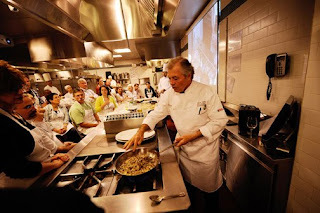 Over two days, each guest took four intimate master cooking classes with the chefs of their choice, including Jean-Georges Vongerichten, David Bouley, Marcus Samuelsson, and all five Deans of The FCI. Between morning and afternoon classes, guests also had the chance to attend Q&A sessions with industry giants such as Dan Barber and Joe Bastianich. To read more about the event, and to view our image gallery, click here.